Ask fellow campers about "Alton RV Park" and nearby attractions. Easy to get to from highway. Made a good one night stay. Very tight for a large rig both getting into and between slots. It is basically a yard with gravel laid out. Likely not a great place to stay at the camp, but seems like a central spot to get to places around. We camped at Alton RV Park in a Fifth Wheel. Well we were hoping they would let us use a portable fire pit since they don't have any except the community one up front but they said no! They did have a clean park we stayed 4 nights visiting relatives. We camped at Alton RV Park in a Travel Trailer. Wal-Mart, Kroger, and plenty of eating places we ate at White Castle one evening but we were there visiting family. Small park with a very friendly host. That being said, it is best for a stop-over or if you are need a spot to park your RV while visiting Columbus. There are no amenities otherwise. They are big rig friendly, but the spot we had (44 ft MH), we were unable to push out our full wall slide as utilities were in the way and we were no able to move over. Again, OK for a stop over, but not much else. We camped at Alton RV Park in a Motorhome. The people running the place are extremely helpful and friendly. We stayed here a week, as it was the closest place we could find to the Nationwide Childrens Hospital. We were in site 25, which was described as having to parallel park, and it was exactly that, but with some extra room. On the passenger side was the interior road, while on the driver side there was some woods, a swamp, and a space for the site's picnic table. The Wi-Fi worked well, as did our AT&T cell phones. The TV worked well on the antenna and on satellite. Connections were well marked and easy to get connected. The water, we were told, comes from a well. I did talk to someone from a water testing lab, who was taking samples, and he told me he was doing the quarterly water testing. This is a basic park, with no amenities. It was clean, and it was quiet. We would stay again. We camped at Alton RV Park in a Motorhome. We stay here while in town for a tent revival in Columbus. It more than meets our needs. We camped at Alton RV Park in a Motorhome. This is not a resort-type campground. The lots are sufficient with the necessities of w/e/s. Wifi has improved over the years and is better then a lot of places we've stayed. The staff are very friendly and helpful. Tiny park. Gravel and grass with no dust. No amenities. But great for over night. In fact if you had something to do near there, more than a night would be okay too. Host was very friendly and helpful. We camped at Alton RV Park in a Motorhome. It is just a tiny nice little park. Neat and clean. Small campground just off busy road into Columbus area. Sites are small and tight. Park is clean and appears well kept. Owners are finishing utility upgrades to support power needs. Some of the longer sites could be challenging to enter pulling long trailer. Some might find the close quarters of the interior drives a challenge. We camped at Alton RV Park in a Motorhome. Very basic, parking lot style, RV Park. No amenities or extra frills. Very tight quarters with little room between sites. Gravel pads and driveways are uneven and muddy. Sewer stand pipes are high (6"-8") above ground level and don't allow good drainage from lower sitting travel trailer; especially considering the site is off level, sloping away from the drain. No cable hook ups, but free wifi available, sporadically. Overall, not a terrible value for a very short stay, but we won't return, if we can find a better alternative. Unfortunately, there aren't many other options available in the area. We camped at Alton RV Park in a Travel Trailer. We are sorry this guest had a less than satisfactory stay. We are in the middle of an electrical upgrade, doubling our electric capacity. This will allow our voltage to remain more stable during hot weather. Unfortunately this camper was parked near an area where underground digging took place for the project. This no doubt temporarily caused some mud and uneven terrain at that time. We are working as quickly as possible to make a more enjoyable stay for each camper. As for the wifi; I am uncertain as to why there were issues with that service. Most of our feedback from campers is that our park offers some of the best free wifi coverage they have experienced while camping. We hired a top notch company to install radio towers; and since we are only 3 acres, the coverage is usually very good. We pay that company to oversee our wifi. At check in we give each camper the user name, password and phone number for tech support. We want our guests to have a positive experience. This is a small and quite nice park. The owners are so accommodating and willing to help in any way. We were wary at first but when I called, the lady with whom i spoke was just the nicest and had exactly what we needed. We stayed a full week and felt "at home". We had a bit of snow two times and FRIGID weather. It is close to Camping World that had repair parts we needed due to the weather. No, it doesn't have amenities one might need for children, but it is perfect for a quiet stay. We would surely come here again. We camped at Alton RV Park in a Motorhome. Call ahead! We were traveling in the winter - this is one of only a very few parks open. We were lucky to get a site. There's very little to do in the immediate area - very nice Kroger is about a mile. Movie theater within 3 miles. Very close to Columbus where there is MUCH to do. Eat at Ann and Tony's in West Jefferson - about 5 miles. Delicious! Very friendly owners. Easy in/out for the pull-thrus. Convenient to Columbus. We camped at Alton RV Park in a Fifth Wheel. Although no laundry, a mile down the road is the Wishy-Washy laundromat. Stores and gas stations within 1 mile. We were having work done on the motorcoach and found this campground online. Staff member greeted us promptly when we pulled in at closing time. She fixed us up with a full hookup-50 amp service. We had to parallel park on the outer circle but were just happy to be parked. Gravel sites and roads, small campground, crowded but okay for a night or two. Glad they had a place for us with all hookups. Thanks to the folks at Alton RV Park! We camped at Alton RV Park in a Motorhome. Overnight stop heading to Indiana. Very nice little park to pull off the road and relax. Temperature today (9/7) was HOT, so we had to run A/C. No shade in center of campground. FHU site worked as they should. Lots of local HD over the air TV channels. Verizon and ATT, both voice and data are excellent. We camped at Alton RV Park in a Travel Trailer. Very close gravel sites. We had a "back in", which was really a parallel parking spot along the road...but we had two of these spots and were able to back directly in and pull directly out when leaving. There was a nice shaded grassy spot on the streetside. People were very friendly. Power was low in the afternoon with all the rigs running A/C, but our power monitor did not shut us down. We camped at Alton RV Park in a Fifth Wheel. Alton RV park is a RV parking lot with full hookups. The only bathhouse had one toilet and one shower each for men's and women's, both clean. On our visit the outside temps were hot and the electric voltage with nothing plugged in was 119VAC, but plugged in with one air conditioner running the voltage was low. At mid-day the voltage was 109, and at mid-afternoon it was 106. It got as low as 105VAC for an extended period. My neighbor confirmed the same and said it was the lowest he had seen. We camped at Alton RV Park in a Fifth Wheel. The location is good for those wanting to be close to Columbus. Great little place near Columbus and I 70. Layout a little strange but it works. Would definitely stay here again. We camped at Alton RV Park in a Motorhome. I would only stay here if I had things to do in Columbus as there is truly nothing to do at this campground except use the bathroom. 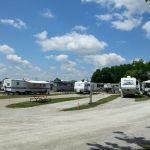 There are several other campgrounds with more family friendly features in Columbus area that while a little farther away, would be a better choice for a relaxing stay. I read this in a previous review of the park and wish I had paid better attention to that fact! Only park close to where we needed to be in Columbus. Krogers was conveniently nearby. I do not think there is much to do around here. Good Krogers grocery store close by. Are you affiliated with Alton RV Park ?